In this lesson, we will learn how to calculate the surface area of a rectangular prism and how to use this in real life. If the perimeter of the base of a cube is 54.4 cm, find its total surface area. What is the surface area of a cube of side 17 centimetres? Find the surface area of a cube of length 11 centimetres. Find the total surface area of a cuboid with length 13 cm, width 3 cm, and height 3 cm. Find the surface area of the rectangular prism shown. 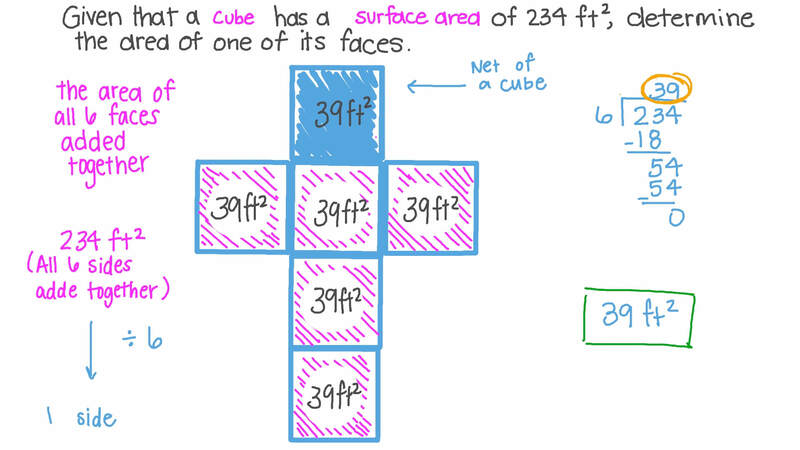 Given that a cube has a surface area of 234 ft2, determine the area of one of its faces. What is the total surface area of a cube whose edge length is 7 cm? Which multiple of the area of a single face gives the lateral area of a cube? The lateral area of a cube is the product of the base perimeter and which of the following? Which of the following expressions represents the surface area of a cube with side length 𝑤 ? Which of the following multiplied by 6 gives the surface area of a cube? The inner dimensions of a swimming pool are 28.8 m, 18.7 m, and 1.2 m. Determine, to the nearest integer, the number of ceramic tiles needed to cover its floor and walls, given that the tiles are square shaped and have a side length of 20 cm. The surface area of a cube is 1 020 cm2. What is the area of one face of the cube? A rectangular piece of cardboard of length 25 cm and width 14 cm is being made into a box. A square of side length 4 cm is cut out of the cardboard at each corner. The remaining part is folded into an open box. Find the surface area of the open box. A metallic cube with surface area 726 cm2 is melted and reshaped into a cuboid with base 16 cm by 15 cm. Find the surface area of the cuboid to the nearest hundredth, if needed. What is the difference in surface area between a cube with an edge length of 16 inches and a cube with an edge length of 5 inches? What is the surface area of a cube whose total edge length is 36 cm? The sides of three cubes are in the ratio 5 ∶ 6 ∶ 4 . What is the ratio of their lateral surface areas? Given that the sum of the edge lengths of a cube is 91.2 cm, find its lateral surface area and its surface area. Find the lateral and total area of the shape below after being folded, and approximate the result to the nearest hundredth. Amira wants to wrap a cube-shaped gift box that has a side length of 20 inches. How much paper does she need? 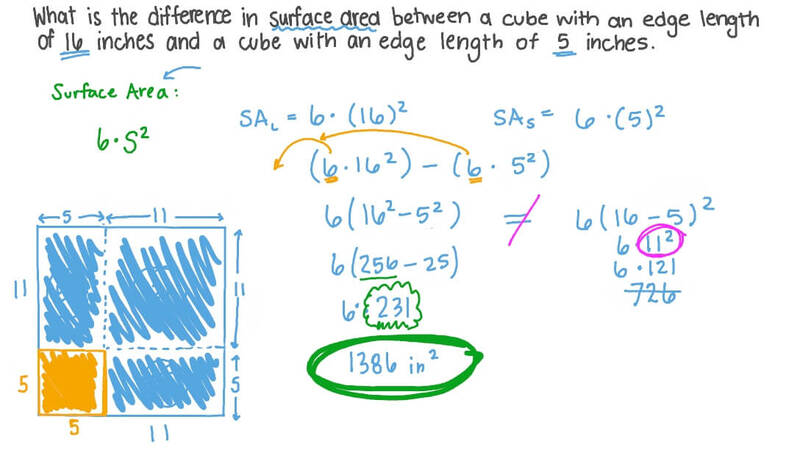 Determine the lateral surface area and the surface area of a cube whose edge length is 3.7 cm. An open-topped box has the shape of a cube. If its lateral surface area is 82.3 cm2, what is the surface area of its faces, to the nearest hundredth? 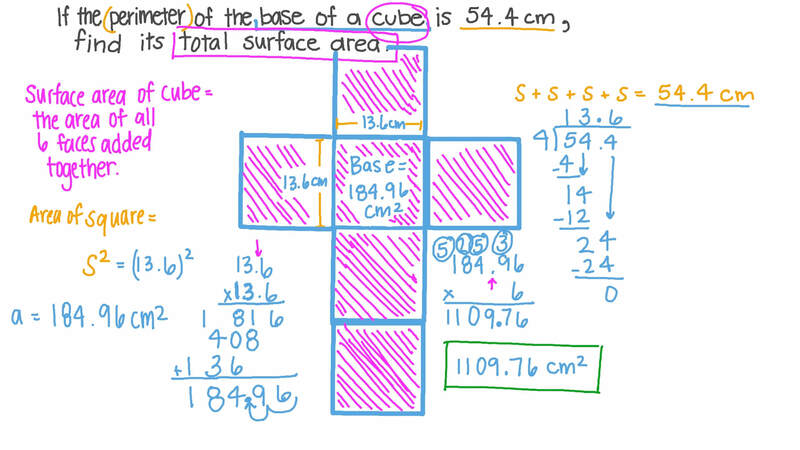 Work out the surface area of a cube with a side length of 5 inches. Find the surface area of this shape. Hint: You can draw the net of the shape to help you.